These pages are a public service, not a commercial site. If you wish, though, you can make a "donation" (not tax-deductible) to help defray the costs of maintaining and hosting these pages. 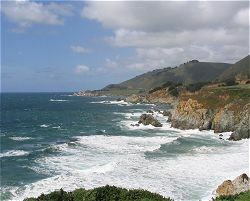 Has this site been worth something to you as you plan a trip to Big Sur -- maybe a dollar or two? If so, you can, if you wish, contribute that amount or any amount by using PayPal. Anyone, with or without a PayPal account, can use a credit card to donate using PayPal; joining PayPal is not necessary. If you have a PayPal account, you can use it. Just use the "donate" button here. Because PayPal charges me a fixed fee plus a commission, please donate not less than US$0.50 (fifty US cents) with PayPal. You can use your Web browser's Back button to return to the page from which you came.